Cruise to Lembongan Island aboard Bali Hai II and moor alongside our purpose built reef pontoon for a full day activities above and below water. Including transfers, morning coffee/tea/snacks, lunch, semi-submersible coral viewer, village tour, unlimited banana boat rides, snorkeling equipment, free use of pontoon facilities. Sail into paradise and enjoy a day in the pristine bay at Bali Hai Cruises private beach club on Lembongan Island. Including transfers, morning coffee/tea/snacks, lunch, fishing on the trip across Nusa Lembongan, village tour, unlimited banana boat rides, snorkeling equipment, free use beach club facilities including swimming pool, valley ball and wave's ski, glass bottom boat rides. Cruise to Lembongan Island aboard Bali Hai II and relax on the golden sands in tranquil Lembongan Bay at the Bali Hai Cruises private Beach Club. 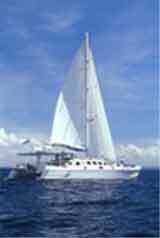 Including transfers, morning coffee/tea/snacks, dolphin, spotting off the south Bali coast. There is no better way to spend a balmy tropical evening than on Bali Hai's evening Dinner Cruise around Benoa Harbour. Including hotel transfers, welcome cocktail, canapes and floral lei, buffet dinner, live entertainment, live cabaret show.